The engine rebuild got off to a brisk start with most of the ancillaries being removed in just a few hours and then the engine was hoisted off the bell housing successfully. That revealed that an incorrect clutch plate had been fitted previously. It was a flat plate, when a dished centre should have been fitted. This had resulted in the rivets at the centre of the clutch plate catching on the flywheel fixing bolts. Then we started to strip down the engine itself. Removal of the cylinder head revealed that the head gasket had been fitted upside down. If such elementry mistakes had been made, we were quite concerned about how much attention to detail had been exercised with the rest of the engine set-up. The photograph shows what was remaining of the tractor after we had finnished that day. The owner began to competely strip down the rear end and prepare the castings for painting. That should keep him busy while the engine goes to the engine remanufacturing shop for some work. Without going into too much detail, we found a whole manner of things wrong with the engine that needed rectifying. Thankfully for the owner the brakes were in good order and required little work. New skins were sourced for the mudguards, new wheel dishes and rims fitted and the handle on the levelling box was re-chromed – otherwise it was just a case of repainting the rear end. That DVD will differ in many ways because of the direct injection on your engine (also you would need to check torque figures) and timing differences, but the DVD would be a good guide. Do you mean the large ones at the back, if so they may also have a seat placement as well I pretty sure these were bulit for the German market some also had a type of front mudgaurd but not sure about them. I’m afraid to say that it’s unlikely that we will be producing a DVD for this engine. We are having our work cut out trying to get DVD’s for the Grey Fergie, Dexta etc. at the moment. Sorry, and good luck with your petrol engine. If you produce a DVD (or DVD’s) on an engine rebuild for FE35’s with the petrol engine, I will buy it immediately. Thank you. The DVD only covers the 23C engine. 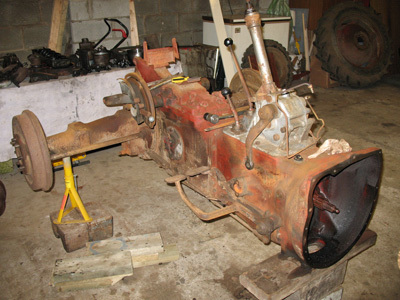 This engine (23C)should have been fitted to the tractor, so has yours had a replacement engine???? There are some quite considerable differences between the 20C and the 23Cengine. The timing is different and so is the method of connecting rod removal, so the DVD probably isn’t going to be of much use to you. We are going to produce a 20C DVD, but it won’t be finnished for several months yet.